The installation under the layout for the signals protecting the Mudgee Branch and the Up Main. The loop LDR and the loop servo are for operating the Branch semaphore when a train comes off the Branch and onto the Main. The main LDR and the main servo are for operating the signal on the Up Main. An auxiliary switch on the Tortoise point motor is used to indicate the direction of the point blades. LEDs inside the lamps to light the spectacle plates are powered by the 5V DC output available from the signal board. For details on the labelled parts see the January 2013 update. With the deadline of our first exhibition for 2013 looming, many hours were put in to have the signalling system installed in time. A total of eleven servo motors and ten signal boards were added to move the arms on ten semaphore posts. To mount the servos to the underside of the baseboard, brackets were fabricated from 50mm x 50mm x 4mm PVC angle. 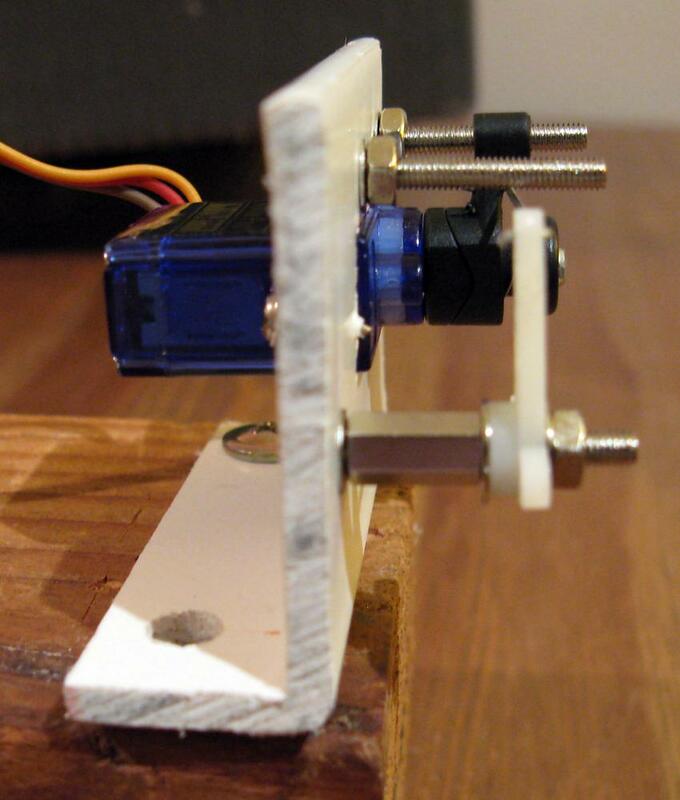 The mounting brackets hold a servo, a servo saver horn screwed onto the servo, stops that limit a signal's travel, and a servo horn that links the servo motor and signal together. The use of two horns gives a finer level of adjustment for signal position and movement. Front view of a servo mounting bracket showing the motor, the black servo saver, the stops in their adjustment slots, and the white servo horn. A length of tinned copper wire links the two horns together. The brass rod from the signal is connected to one of the holes on the horizontal axis of the white horn. The servo saver horn is designed to protect the gears in servos used for steering radio controlled cars. In our application, we are using them to protect the delicate signals from any untoward movements an errant servo may make. Once the semaphore arm positions have been set through the setup program on the PICAXE, the stops are tightened in position at each end of the horn's throw, so the horn on the servo saver can only move between the stops. 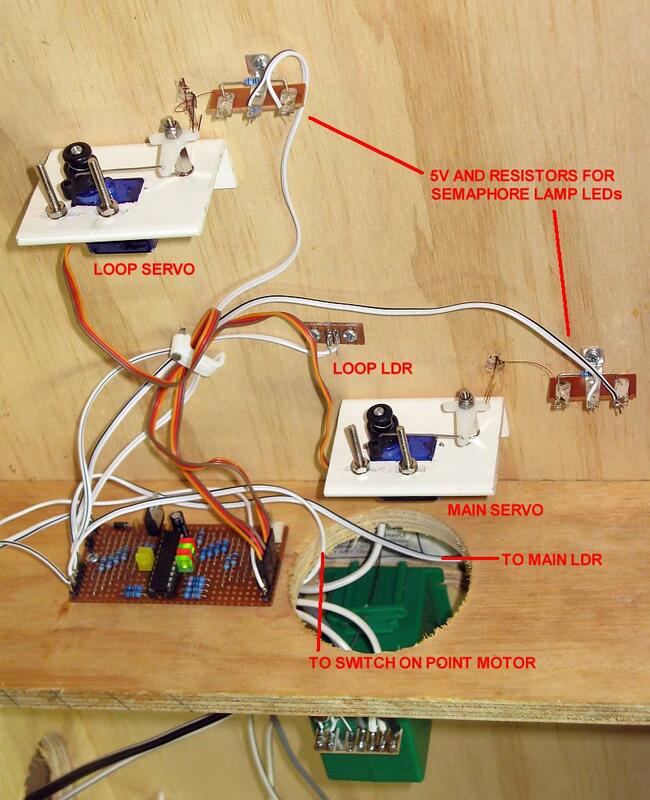 If the servo does malfunction it can still turn freely, however the signal will not move past the positions it has been set up for, and neither the signal nor the servo will be damaged. The tensioning springs that come with the servo savers are far too thick for this application, so replacement springs of lighter gauge were sourced from a local hardware, cut to length and used in their place. Side view of a servo mounting bracket, showing the servo saver horn between the two stops. 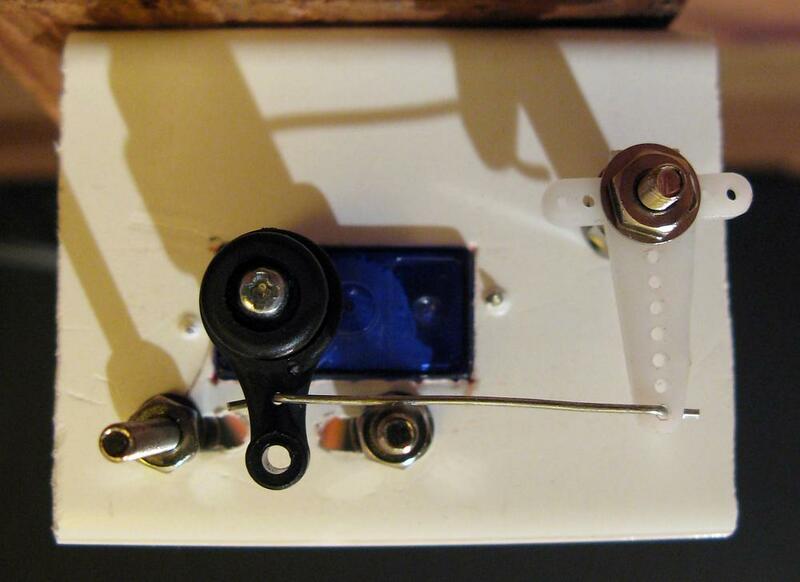 M3 (3mm) hardware is used for the stops and for mounting the white servo horn.